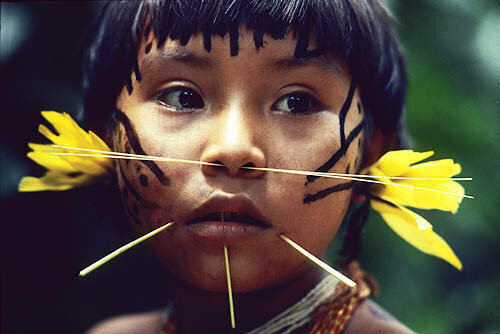 Yanomami tribe lives on the border of Venezuela and Brazil. The Yanomami territory in Brazil is twice the size of Switzerland. 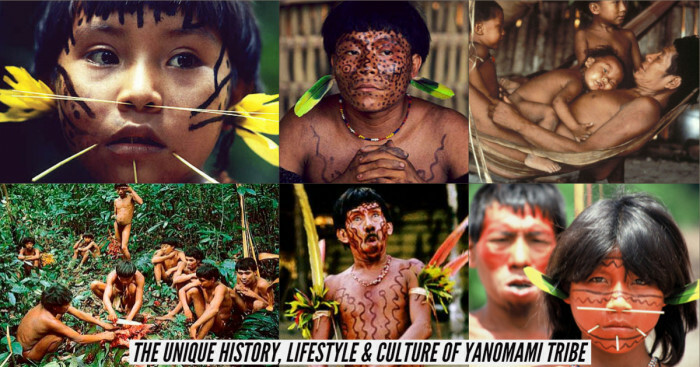 Let us unfold more facts about Yanomami tribes here. The Yanomami or Yanomama is one of the largest indigenous tribes in the Amazon. Nearly 30000-35000 indigenous people are living in 250 villages in northern Brazil and southern Venezuela. Because the Yanomami have no genetic or linguistic affinity with their neighbors, the geneticists and linguists who studied the tribe explained that they were the descendants of an indigenous group that remained isolated for a long time. As per the Yanomami oral tradition and the documents mentioning this group, the center of their habitat is situated in the Parima mountain range. The movement of the Yanomami people from the Parima range began in the 19th century. Several authors have used different names and spellings including Guaica, Yanoama, Yanomame, Guajaribo, Guaharibo, and Xiriana. The Yanomamo are South American Indian and speakers of Xiriana language who first came into contact in 1929. Until the end of the 19th century, Yanomami only had been in touch with other indigenous groups. In between 1940 and 1960’s, the opening of the SPI posts and various evangelical missions initiated the contact within their territory. The Yanomami language family contains four subgroups: Sanuma, Ninam, Yanoma, and Yanam. Some authors have described the Yanomami as one of the most primitive stone-age tribes. However, this characterization is inappropriate because the Yanomami are horticulturalists who possess advanced knowledge of crops and culture. They also know the advanced bow and arrow technology introduced over thousands of years ago in America. Although Yanomami is described as ‘stone-age-tribes’, they do not use stone tools. Instead, they use wooden arrow points. The Yanomami tribe and people do not believe in having one leader, they only believe in equality and make decisions together. They are classified together because they have blood relations and affection. They prefer marrying inside the community with a cross-cousin (son or daughter of maternal and paternal aunt). A day work of Yanomami tribe is finished within 5 hours, the rest of the time is used in doing social activities like decorating baskets, painting one another, etc. The first report of the Yanomami came in 1759 when a Spanish expedition under Apolinar Diez de la Fuente visited some Yekuana people living on the Padamo River. From 1630 to 1720, the river based indigenous societies who lived in the same region were vanished as a result of slave-hunting expeditions by the Bandeirantes (17th-century Portuguese settlers in Brazil). In Roraima (least populated state of Brazil), the 1970’s saw the implementation of projects within the framework of the ‘National Integration Plan’ initiated by the Brazilian military governments of the time. It meant the opening of the perimeter road and several colonization programs on land occupied by the Yanomami. In 1978, the CCPY (Pro-Yanomami Commission) was established. Originally recognized as the Commission for the creation of a Yanomami Park, CCPY is a Brazilian non-governmental non-profit organization especially dedicated to the defense of the territorial, civil and political rights of the Yanomami. The Yanomami community comprises a society of hunter agriculturists of the rainforest of Northern Amazonia. Their territory covers an area of over 192,200km located on both sides of Brazil and Venezuela. 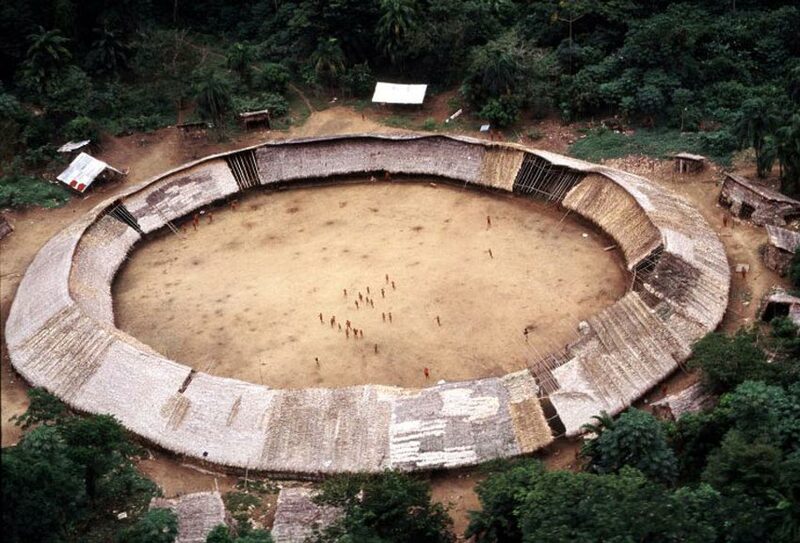 The total population of the Yanomami in Venezuela and Brazil is calculated to be around 32,000 people. According to the reports, in Brazil, the Yanomami population was around 12,795. 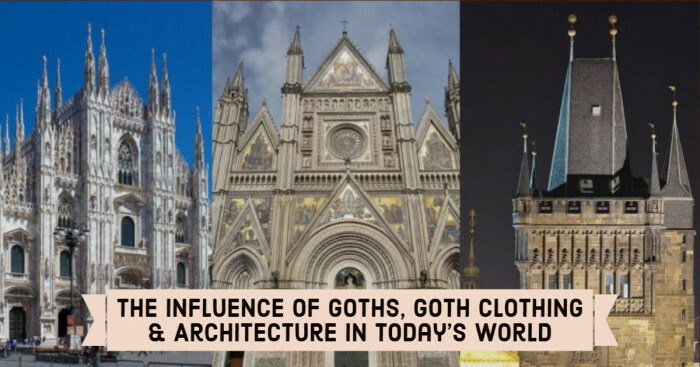 Later, they were divided into 228 communities. The Yanomami Indigenous Territory which covers 96,650 km of tropical forest is better known for its importance toward protecting Amazonia’s biodiversity and was made legal by Presidential decree on 2th May 1992. It was in 1980 when over 40,000 Brazilian gold miners invaded their land. 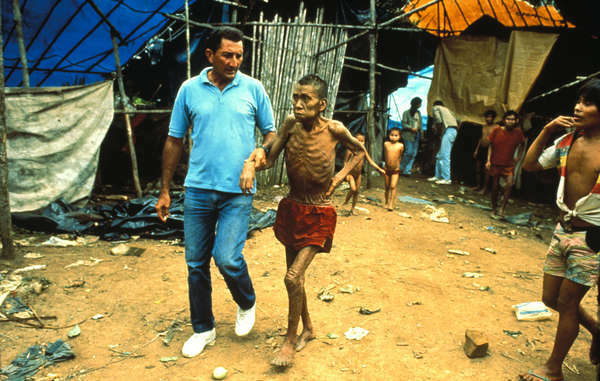 The miners destroyed their villages and exposed them to diseases to which 20-25% of Yanomami died in just seven years. After a campaign by Kopenawa, Yanomami land in Brazil was demarcated as the Yanomami Park and the miners expelled. After the division, the gold miners returned. Again in 1993, a group of miners entered the village of Haximu and killed 15 Yanomami including young children. The situation in Brazil and Venezuela is serious, but the authorities have done a little to resolve their problems. 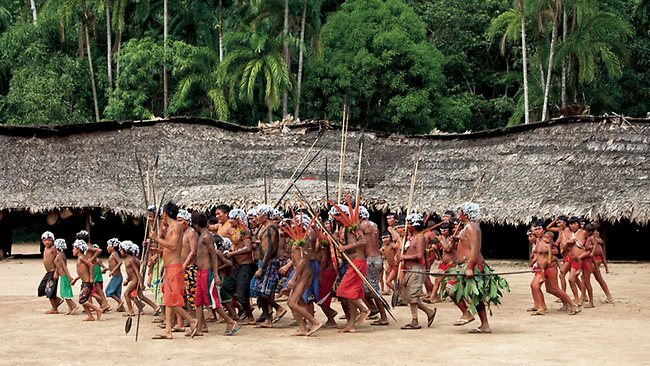 The Brazilian tribes still do not own proper rights over their land. The Yanomami area is reduced in size and is opened up to mining and colonization. Villages of Yanomami people vary in size. The entire village lives under a roof which is called shabono. Shabonos have an oval shape, an open ground with a measure of 100 yards. It is built from raw materials from the surrounding forest such as tree trunks, vines, and leaves. The shabono is susceptible to insect infestation, rains, and winds. The new shabonos are constructed after every 4-6 years. 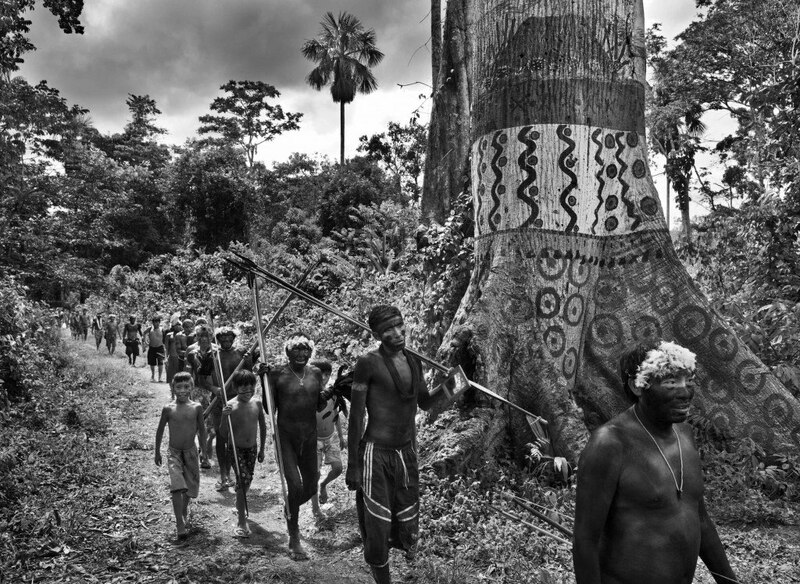 The Yanomami tribe is known as fishers, hunters, and horticulturists. While women cultivate cooking plantains (cooking bananas) and cassava in gardens, men do the work of cleaning, mainly forest areas for gardens. Another major food source for the Yanomami people is grubs. As the traditional Yanomami diet is low in salt, their blood pressure is lowest among the demographic groups. Due to this, the Yanomami have been the subject of studies relating to hypertension and sodium consumption. The Yanomami tribe celebrates a good harvest with a huge party, to which all the nearby villages are invited. They gather a large amount of food which helps to maintain a good and healthy relationship with the neighbors. 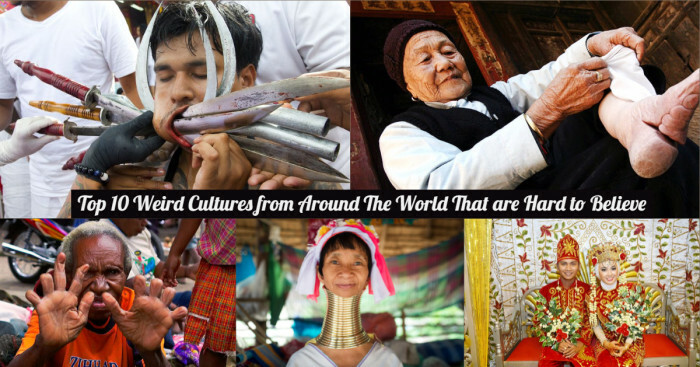 During the feast, they eat a lot, women dance, and sing songs at night. The women of the Yanomami tribes are responsible for domestic duties. They do not hunt but work in the gardens and gather nuts and fruits. Women cultivate until the gardens are no longer fertile. They carry 30-35kgs of crops on their back during harvesting. Yanomami women decorate their baskets with roots and small strings of bark. They use a red berry (onoto) to color the baskets and paint their bodies. The baskets are further decorated with charcoal pigment. Entheogens or known as yakoana are used by Yanomami shamans as a part of healing rituals for ill people. It is derived from the tree Virola elongata. The Xamatri use the powdered bark of Virola elongata with the seeds of yopo to produce the drug ebene. It is extracted from plants ground in powdered form and then mixed with saliva. The Yanomami tribe practices ritual called endocannibalism. In this ritual, they consume the bones of deceased kinsmen. The body of the deceased person is wrapped in leaves and placed in the forest at a distance from the shabono. After the insects consume the body, the bones are then cremated. Later, a bizarre tradition is carried out in which ashes are mixed with a soup made of bananas, which is then consumed by the community. Sometimes the ashes are kept preserved in a gourd, and the ritual is repeated annually. This tradition is meant to strengthen the Yanomami people and to keep the spirit of individuals alive. The Yanomami eat everything that jungle offers. 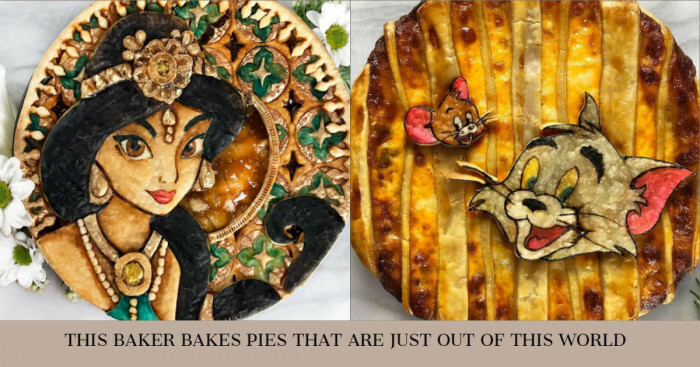 They consume all kinds of wild pigs, deer, monkeys, jaguars, larvae, wild honey, sweet potato, palm fruits, varieties of insects and more. 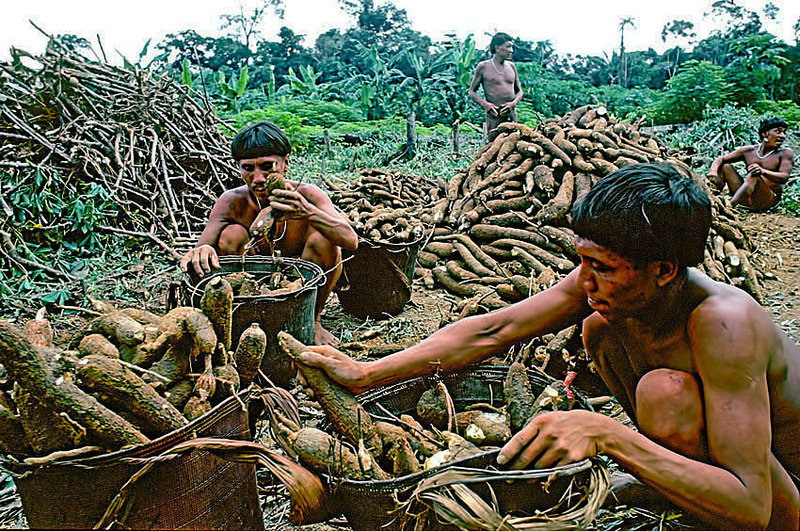 Nearly 80-90% of the food consumed by the Yanomami community is from their gardens. According to a study, Yanomami people lack protein in their diet because they eat mostly fruits and vegetables. Yanomami tribe clothing is very decorative. They usually do not wear many clothes. The amount of clothing depends on their ranking. People who are higher in ranking wear fewer clothes but more decoration. The lower ranks usually wear weaved clothes. Women use cotton yarn and make beautiful waistbands and halter-neck adornments that cross between breast and the back. 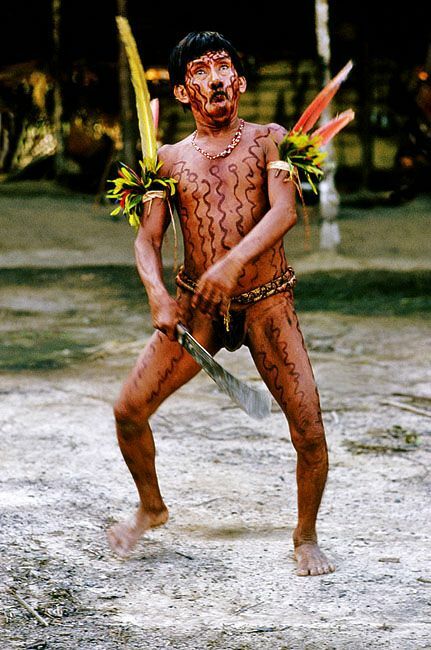 The Yanomami people decorate their bodies with beads, paints and much more. The paints are made from fibrous plants in the forests they live. The red paint made from annatto tree seeds is used as suntan lotion, perfume, and repellant. The black paint made from genipap tree fruit is used for decoration. Mostly, Yanomami people use beads and jewelry to decorate their bodies because they can’t wear many clothes. If they wore, they would likely get overheated. Men only wear small loincloths. Several groups and organizations are supporting the future of the Yanomami people. David Good, son of the Kenneth Good (anthropologist) and wife Yarima, launched ‘The Good Project’ to help and support the Yanomami tribe. The Germany-based NGO, Yanomami-Hlife eV is building schools and medical stations in Brazil and Venezuela for the Yanomami tribe. The founder of the group Christina Haverkamp crossed the Atlantic Ocean on bamboo to know more about the Yanomami life and to draw attention at their lifestyle. It was in 1988 when the US-based WWF (World Wildlife Fund) funded the musical Yanomamo to make people aware of Yanomami and their environment in the Amazon rainforest. The fund describes Yanomami tribes living in the Amazon and performs drama around the world. CCPY (Comissão pela Criação do Parque Yanomami) is a Brazilian NGO which aims at improving education and health for the Yanomami. The NGO was established by anthropologist Bruce Albert, photographer Claudia Andujar, and Catholic missionary Carlo Zacquini. They launched a campaign to promote the destructive effects of the garimpeiro invasion and also promoted the political movement to assign(name) an area along the border as the Yanomami Indigenous Area. Thousands of gold miners are now working on Yanomami land. It is spreading deadly diseases and polluting the rivers. Therefore, the Yanomami tribe is suffering from poor health. Unfortunately, medical care is not reaching Venezuela. 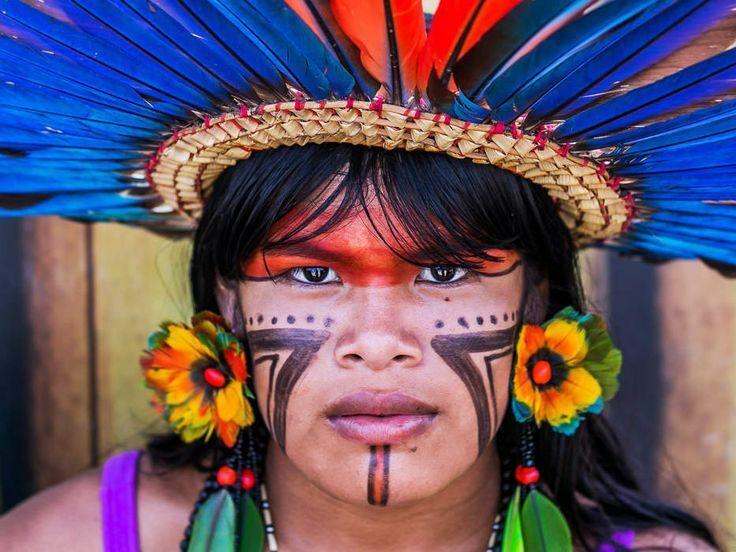 Moreover, the Brazilian congress is debating for the bill which permits large-scale mining in indigenous territories. And this will be more harmful to the Yanomami and other tribes in Brazil. The Yanomami is the largest isolated South American tribe which strongly believes in equality among people. They did not socialize outside world but had embraced the strong culture in Venezuela and Brazil. Have you ever met Yanomami people? The Yanomami in Venezuela formed their organization which is called Horonami in 2011 to defend their rights.